So there I was… imprisoned in a small cell no larger than a cardboard box in which a refrigerator might be delivered. Cut off from the outside world with no technology at all! 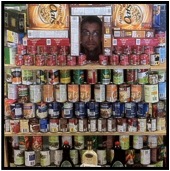 I was surrounded by all manner of strange boxes and cans… of food! That’s right, I was imprisoned in a fortress of non-perishable food as part of an effort to raise funds, food and awareness for the annual Greece Teachers Association Food Drive. The drive is an incredible collaboration of many Greece schools in support of the Greece Ecumenical Society. Each year, schools compete to see who can get the most food donated. A school bus visits each school to pick the food up and by the end of the day it is absolutely stuffed. In an effort to encourage our students to bring in lots of food, Mrs. Watson and her Social Studies classes dreamed up the idea that if the students could donate enough food to create a prison, I would have to sit inside this prison in the commons area until the bus arrived to pick the food up. However, my simple imprisonment was not enough… oh no! The students felt that I should also be banned from all use of technology during this time. This, I must say, was a torture that bordered on cruel and unusual punishment and seemed very un-American. However, I try to be a good sport with things like this and I allowed for my incarceration to occur on the Friday before the Winter Recess. My imprisonment lasted for nearly 4 and a half hours, and it wasn’t all that bad… several students snuck me cell phones, but each time I was caught! All in all it was a lot of fun, and we ended up placing second in terms of total pounds of food donated! Way to go Spartans! So, why am I writing about this in my column? This doesn’t have anything to do with academics, and we are a mere 15 weeks from graduation (can you believe that our 4 years together are almost over?) and beyond. Every column I have written so far has focused on pushing and challenging the members of the Class of 2011 to focus on their studies and push hard toward personal success. However, as I reflect on this class and everything we have been through, I have to say that I am so proud of each and every one of you. The Food Fortress is only one small example of the excellence, passion and intensity our students have learned and developed over the past several years. On the same day as my incarceration, we had our second annual Cart Parade (see page 2 for pictures) in which many clubs, teams and departments collected food and decorated shopping carts. That same day we also honored our Sectional Champion Track Team for their hard work and success, as well as wrestler Joe Bonaldi for his Section V Championship. There is so much incredible stuff going on here at school that we could fill a newsletter 10 times thicker than this one. It is such an honor to be a part of this community. The students and staff at Olympia never cease to amaze me! We truly are… Olympia. With all that said, enjoy these last few weeks of high school. Work hard and push on to the end, but enjoy this time. I am so proud of you. It is an honor to be a Spartan!